MAPACA is a cooperative group of alpaca breeders in the Mid-Atlantic states of Delaware, Maryland, New Jersey, New York, Pennsylvania, Virginia, Ohio and West Virginia. We are a diverse group with herd sizes ranging from 2 to over 200 alpacas. On our farms you will find some of the most exquisite alpacas in the world in a natural rainbow of colors. We have hundreds of huacayas and suris representing some of the most well-established bloodlines in the country with over 4 generations of successful, documented reproductive history! You have a tremendous selection to begin your foundation herd or add that missing element to your existing herd. Our commitment to education, support, and quality, forms the foundation on which a new breeder can build and thrive. We can answer the questions that you already have and guide you towards the questions you should be asking. Raising alpacas is an exciting and rewarding journey and we look forward to helping you on your way. 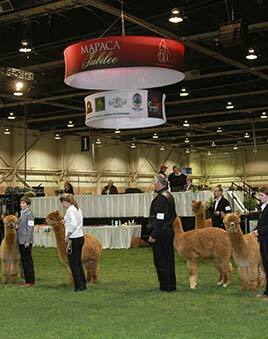 You will find MAPACA breeders to be hospitable and extremely knowledgeable, although often understated. We come from all walks of life and are bound by a passion for these magnificent creatures. Come visit our farms and see our fleecy treasures. Experience some of our famous MAPACA hospitality… we promise you'll be more relaxed, more knowledgeable, and just a little dreamy-eyed. The MAPACA Jubilee is one of the largest alpaca shows in the United States. The Jubilee is held annually in the spring and includes mini-seminars, guest speakers, vendors, a fleece show, and of course many beautiful alpacas. The highlight of the event is an AOBA-sanctioned show with ribbons and championship banners. This has been one of the largest shows in the world! Most importantly, all attending have a lot of fun! The Jubilee is usually held at the Pennsylvania Farm Show Complex in Harrisburg, Pa. More information on the Jubilee can be found on the Jubilee page here. Membership Meetings - Held periodically to provide a forum for members to communicate their views, plan, organize, learn, and have fun. More information on Member Meetings can be found here. Newsletter - The MAPACA Showbook / Newsletter is a full-color publication distributed to members and at our Show. It keeps members informed on MAPACA activities and provides a forum for members to share knowledge. Check out the available on-line issues downloadable in convenient PDF format. If you are interested in submitting an article for consideration, please e-mail it to Carole Rost at crost51@gmail.com. Web Site - MAPACA members can have a presence on the Internet through our web site. Members can have their own farm profile page and can also advertise alpacas for sale. If you are a member and do not see your listing, please contact info@mapaca.org. There are two member lists that are maintained by MAPACA, both of which are on the web site in the drop-down menu. The first link—"MAPACA Member Farms"—is a proprietary member database that is used for Jubilee registrations and membership dues tracking; your data is entered on this list when you join MAPACA online. The second list—"Search Members via Openherd"—is maintained by OpenHerd so that members can easily advertise their farms and alpacas for sale or stud. In order for your farm to appear in the OpenHerd list, you must "Join" OpenHerd through their Affiliate Program. This is a FREE, one-time step, and provides an extra marketing feature for your farm. Simply go to www.OpenHerd.com free membership page and create your account. When you've completed this process, please notify the board, and someone will activate your listing so it appears in the OpenHerd section of the MAPACA web site. For more information, please contact the board at bod@mapaca.org, or see the MAPACA BYLAWS.